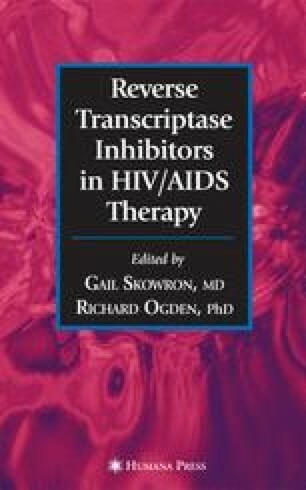 Since the identification of HIV as the etiological agent of AIDS, the HIV reverse transcriptase (RT) enzyme has been considered an ideal selective antiretroviral drug (ARV) target. Although several polymerases are found in human cells, none are comparable to HIV RT in their ability to catalyze the synthesis of new DNA from an RNA template. A selective RT inhibitor should, therefore, exert limited toxicity. The RT enzyme plays a crucial role in the early stages of the viral life cycle and can be competitively inhibited by chain-terminating nucleoside analogs (several of which were synthesized for basic research use well before the discovery of HIV). Therefore, it is not surprising that nucleoside RT inhibitors (NRTIs) were the first ARVs to be made available for the treatment of HIV infection. There now exist two additional classes of RT inhibitors, with independent modes of action; the non-nucleoside RT inhibitors (NNRTIs), first discovered in the early 1990s (1, and the nucleotide RT inhibitors. As described in detail in the earlier chapters of this volume Chapter 11 to Chapter 14 the NNRTIs act by noncompetitive binding to a hydrophobic pocket on the p66 subunit of the RT enzyme. The consequence of NNRTI binding to this unique site within the RT alters the ability of the enzyme to carry out its function. The current generation of NNRTIs selectively inhibits HIV-1 replication, reflecting their very high specificity for RT. They even have no significant activity against HIV-2, simian immunodeficiency virus, or other studied retroviruses. Unlike the NRTIs and the nucleotide RT inhibitors, NNRTIs do not require intracellular activation through phosphorylation.